This time last year, people were talking about the end of the European Poker Tour. Following last week’s announcement that the EPT was back, there was hardly any fan fare in what will undoubtedly be the final PokerStars Champsionship event, PSC Prague. The final table of the €5,300 Main Event included some trash talk, a deal and eventually, a new champion. 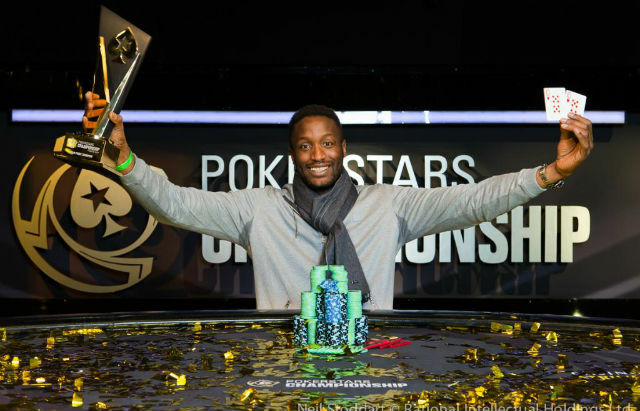 Kalidou Sow defeated Jason Wheeler heads up to win €685,000 ($807,899). It took only one hour to go from six players to five. Down to just nine big blinds, Colin Robinson moved all in for 940,000 and Kalidou Sow called. Robinson turned over while Sow was ahead with . The board ran out to give Sow a turned set and eliminate Robinson in sixth. Five hands later Wheeler picked up his first elimination of the final table. Action folded to Wheeler in the small blind and he moved all in. Harry Lodge called from the big blind only to find out he was dominated. Wheeler had and Lodge was behind with . The flop gave Lodge a flush draw but neither the turn or river were any help and Lodge was out in fifth. One hour later, Wheeler picked up another victim. Wheeler raised to 230,000 from UTG, Sow call from the button and Gabriele Lepore defended his big blind. After the flop, Lepore and Sow checked to Wheeler who bet 330,000. Sow folded before Lepore moved all in for 1,960,000. Wheeler called and tabled while Lepore showed . The turn was the and the river was the to miss all of Lepore’s draws and eliminate him in fourth place. Three-handed play carried on for two hours with Wheeler holding more than half of the chips in play when he found himself clashing with Sow. Wheeler raised to 335,000 from the small blind and Sow defended his big. The flop came . Wheeler bet 350,000 and Sow called. The turn was the and Wheeler bet 700,000. Sow responded with a raise to 1,555,000 and Wheeler moved all in. Sow called and tabled for the nut straight while Wheeler showed for the bottom end of the straight. The river was the and Sow doubled up to nearly 14.5 million – roughly 60% of the chips in play. There was yet another hour-long gap between eliminations and once again it was Wheeler doing the heavy lifting. Sou raised to 240,000 from the button, Michal Mrakes moved all in for 1,815,000 from the small blind and Wheeler called from the big blind. Sow folded. Mrakes flipped over while Wheeler showed . The flop moved Mrakes ahead. THe turn gave Wheeler a flush draw but it was the on the river that gave Wheeler the pot and sent Mrakes to the rail. Heads-up play began with Sow holding 55% of the chips in play and after a short break the two agreed to a deal largely dictated by Wheeler. Each player guaranteed themselves €570,000 as the cruz of the chop agreement, with €105,000 left to play for. It took only 19 hands for Sow to eliminate Wheeler and pick up the additional €105,000. Wheeler raised from the button to 425,000 and Kalidou re-raised to 1,375,000. Wheeler responded by moving all in for 6,035,000 total and after taking a minute to think about it, Sow called. Wheeler showed and Sow tabled . The board ran out to give Sow the pot and the first major win of his career.